Delamere and Oakmere News is prepared and distributed by local volunteers, with support from Delamere and Oakmere Parish Council. It is published three times a year, in Spring, Summer and Autumn/Winter (before Christmas). Articles, ideas for articles, news of recent events or forthcoming ones, advertisements, and any other contributions relevant to Delamere and/or Oakmere are always welcome (inclusion subject to editorial discretion). For editorial material and advertising contact: do_newseditor@yahoo.co.uk. The printing costs of the newsletter are covered mainly by advertisements, and the support of our advertisers is very much appreciated. 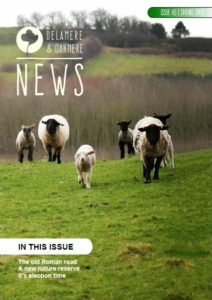 The current issue and past issues are available to view and download below. Printed copies of some of the earlier issues are also available (contact the editor if you would like one).